This new reference book is the most comprehensive annotated bibliography available on seventeenth century works by, for, and about women. 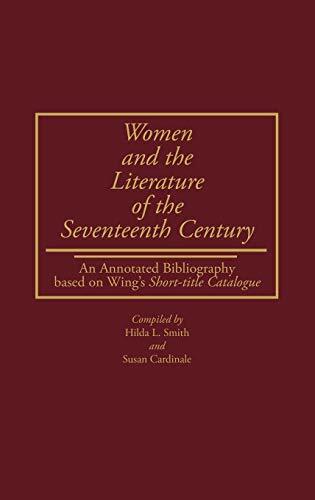 Based on the Wing Short-title Catalogue, it offers descriptions and assessments of just over 1,600 items written between 1641 and 1700 (637 by women and 973 for and about women). The preface explains the volume's organization and relates it to other standard reference sources. A lenghty introduction discusses the bibliography's intellectual history, its place within the context of recent scholarship about seventeenth-century English women, and the range of material covered. Part I includes religious and literary works, petitions, journals and diaries, commentaries on women's social position and domestic role, and philosophical treatises by women. Additional material appearing in the Thomason Tracts collection, as well as items written by women during the period but published later, expands the Wing entries. Part II lists publications for and about women. Many discuss obstetrics and female sexuality, satirize women's alleged garrulousness and lasciviousness, offer advice about domestic and religious duties, or relate bizarre tales about women. The tone and focus of writings in the two sections are quite distinct, possibly because women usually wrote for personal gratification or out of dedication to a cause; thus, their work was characterized by urgency, enthusiasm, and honesty. On the other hand, men's writings often reflected a commercial interest, so they rarely seem products of the heart. HILDA L. SMITH is Director of The Center for Women's Studies and Associate Professor of History at the University of Cincinnati. She is the author of Reason's Disciples: Seventeenth-Century English Feminists (1982). SUSAN CARDINALE was previously a Reference Librarian and Rare Books Librarian at the University of Maryland. She is the author of Anthologies by and About Women: An Analytical Index (Greenwood Press, 1982).